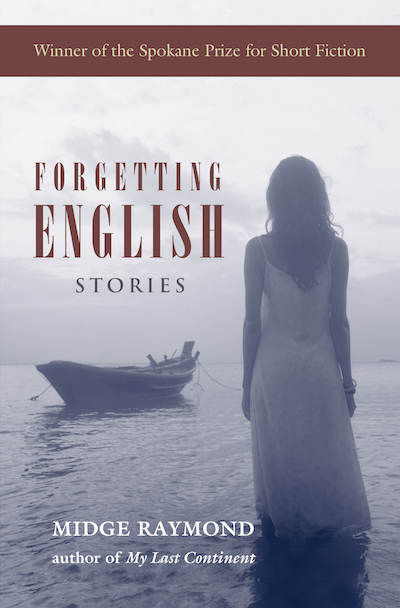 I’m pleased to announce that Ashland Creek Press has published the third edition of Midge’s Raymond’s award-winning short story collection, Forgetting English. In this new, expanded edition of her prize-winning collection, which includes a reading group guide, Midge Raymond stretches the boundaries of place as she explores the indelible imprint of home upon the self and the ways in which new frontiers both defy and confirm who we are. The characters who inhabit these stories travel for business or for pleasure, sometimes out of duty and sometimes in search of freedom, and each encounters the unexpected. From a biologist navigating the stark, icy moonscape of Antarctica to a businesswoman seeking refuge in the lonely islands of the South Pacific, the characters in these stories abandon their native landscapes—only to find that, once separated from the ordinary, they must confront new interpretations of whom they really are, and who they’re meant to be.